First mentioned in a newspaper discovered May 13, 2010, where Gordon Cooper is illustrated as their mascot. Sorry, kids!!! Captain “Coop” Cooper is out solving a thrilling space mystery! 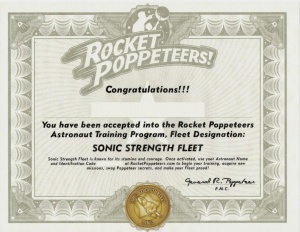 Become a certified Rocket Poppeteers Astronaut today! Sorry, kids!!! Captain “Coop” Cooper is out bringing justice to the galaxy! Become a certified Rocket Poppeteers Astronaut and join the Race to Outer Space! Sorry, kids!!! Captain “Coop” Cooper is out battling The Red Cozmo! Become a certified Rocket Poppeteers Astronaut and join the Race to Outer Space! Sorry, kids!!! Captain “Coop” Cooper responds to certified Rocket Poppeteers only! Send in your application today! Sorry, kids. Captain "Coop" Cooper is out on another cosmic adventure! Become a certified Rocket Poppeteer Astronaut and join the race to outer space! Subsequent emails have only gotten the "Red Cozmo" response with minor changes in capitalization, as if the response were being refined. 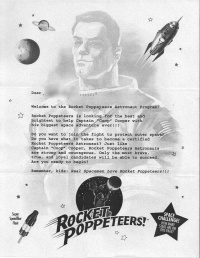 If the Rocket Poppeteers Astronaut Program membership form was sent in with the completed maze, this letter will be sent back with another puzzle to solve. his biggest space adventure ever!!! Do you want to join the fight to protect outer space? true, and loyal candidates will be able to succeed. Space Challenge! How many stars are on this page? It's speculated that the correct answer should be emailed to the above address, captaincoop@rocketpoppeteers.com. Those that registered with RP.com and/or completed the survey received a certificate in the mail. Includes Astronaut name and a case-sensitive alpha-numeric code. On the envelope, just above the persons real name and address is a number followed by the astronaut name. The purpose of this number is not yet known.